Two 11 year old kids – Corey and Alliston – came into the Visionary Eyecare Office in Pembroke Pines… they were selling candy TO BUY THEIR OWN school supplies when our lead tech, Carol Marsh-Urquhart, was in charge. Carol was so touched by their humbleness and exuberant entrepreneurial energy in finding a way to buy their own school supplies that she thought of ANOTHER WAY to help them get their supplies. She contacted her church – Christ The Rock in Cooper City – and inquired about any program that would help kids in need. Carol was able to get 2 book bags filled with school supplies for the two youngsters. She then called the kids, Corey and Alliston, who were extremely happy to FINALLY have their school supplies!!! During this encounter, Carol also had noticed that Corey had a very severe and cosmetically troublesome eye turn and thought about ways in which she could help him with his problem – maybe there was a way that she could help him get his eyes properly aligned…. Carol spoke with our Eye Doctor, then connected him with Nova Optometry Pediatric Department for his specialized optometrist eye exam and then connected him with the Lenscrafters OneSight Program so he was able to get a new pair of glasses. Carol also was able to contact a local Pediatric Ophthalmologist, Dr Bruce Miller, for Corey. After a couple of visits to the Ophthalmologist, surgery is now scheduled to correct Corey’s eye turn. Corey’s mother had absolutely NO IDEA that her son’s eye turn could be resolved – she thought that Corey was just born that way and that nothing could be done about this very cosmetic eye turn problem. She thought that Corey would have to live with his eye turn forever. 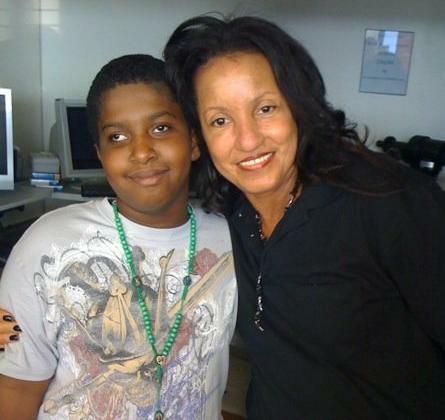 Corey and his mother are now eternally thankful to Visionary Eyecare’s lead tech, Carol, for helping her son to be able to live his life without this troublesome eye turn – called strabismus. Our patient, Barry, gives a video testimonial about his eye exam experience at Visionary Eyecare (Independent Doctors of Optometry Next to LensCrafters) INSIDE the Sawgrass Mills Mall. Barry has had eye exams ALL OVER THE WORLD – England, Australia, Asia etc. 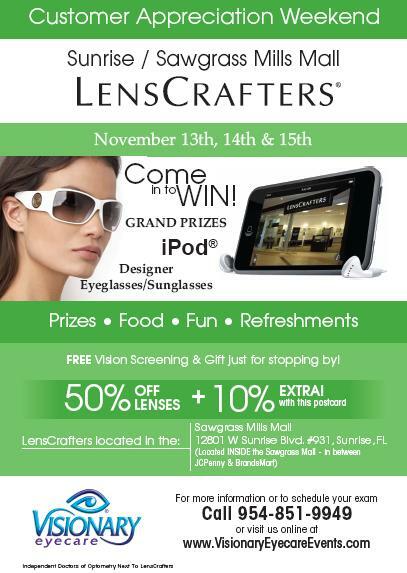 He came to LensCrafters inside the Sawgrass Mills Mall looking to get a quick eye test done. LensCrafters referred him next door to the Visionary Eye Care office. Barry was used to paying a very minimal fee for a 10-15 minute eye test. He had no idea that an eye exam could be so thorough and comprehensive. When we started doing his eye exam – he was immediately “blown away” by the high-tech equipment, the thorough exam, all of the attention that was given to him and also the caring Optometrist who took A LOT of time to meet his exact needs to ensure that he was completely satisfied. Barry decided to go ahead and get fit with bifocal contact lenses with Dr Dawn Bearden. An accurate bifocal contact lens examination, done correctly, usually requires several follow up visits. Barry lives in the Bahamas but, he was so impressed with the care at Visionary Eyecare – he decided TO CONTINUE TO FLY BACK AND FORTH to continue his eye care with the Eye Doctor here at Visionary Eyecare!! Today he was so happy as he left our office – he now could see distance and read up close without wearing his glasses all of the time! He could also now wear those cool non-prescription sunglasses over his bifocal contacts when he is out on his boat or driving in a car during his worldly travels. Barry says that he will definitely always come back here for his eye care and recommend Visionary Eye Care to all of his friends. Now THAT is a happy patient! Cataracts are a normal and common part of the aging process but, they do not have to interfere with your lifestyle. A cataract is a cloudiness of the crystalline lens inside of your eye. As your lens gets cloudier, your vision will gradually become more blurred. The human eye may best be compared to a camera. When you take a picture, the lens in the front of the camera allows light through and then focuses that light on the film in the back of the camera. When the light hits the film, a picture is taken. The eye works in much the same way. In youth, the crystalline lens of your eye is clear and allows light to pass through. Light is focused by your cornea and your crystalline lens onto a thin layer of nerve tissue in the back of your eye called – the retina. Your retina works like the film in a camera. When the focused light hits the retina – a “picture” is taken and sent to your brain. While a dirty camera lens blurs a picture, any significant cataract or cloudiness in your crystalline lens will blur the images that you see. When a cataract becomes significant – your vision can become quite blurry. It is suggested if your vision drops below 20/40 or so….then it is common to be told to see an eye surgeon to have cataract surgery. This surgery involves taking out the cloudy crystalline lens (cataract) and replacing it with a clear implant. Often your surgeon can even do a calculation that can place your current eyeglass prescription into the lens implant. The result after the cataract surgery can be much clearer vision and often there is no need for glasses after the surgery! For more information – see your local Optometrist or Dr Dawn Bearden or Dr Anna-Kay Tenn in Pembroke Pines 954-430-3808 or Sunrise 954-851-9949 for your yearly eye exam and they will be happy to discuss cataracts and cataract surgery options with you!